Deal Categories: Protein Powder.Stores: Amazon. The price for the popular Dymatize Elite Whey Protein (5LB) drops from $47.62 to as low as $38 shipped when you Subscribe & Save & clip the coupon on Amazon. You can cancel your subscription after the item ships. 5 flavors available for this price. Other flavors available for few dollars more. Rated “Excellent” 4 out of 5 stars. Deal Categories: Protein Powder.Stores: DPS. DPS nutrition is offering a 15% side wide promotion for a limited time with code ‘ DPS10‘! This includes the rarely reduced Merica Labz line of products. Deal Categories: Protein Powder.Stores: Suppz.com. The price on the Quest Nutrition Protein Powder (2 Lbs. 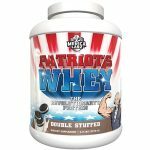 – Chocolate Milkshake, Multi-Purpose) drop from $60 to $29.99 TO $28.49 at Suppz. Use coupon code ‘FDN6‘ during checkout to shave 6% your entire purchase. This is the best total price we saw by at least $31.